A puzzle game released for the bit Generations series on Game Boy Advance and Art Style series on Wii. You control the "Hex", a hexagonal marker that rotates the six coloured triangles contained inside. Clear the triangles by matching their colours in a hexagon. 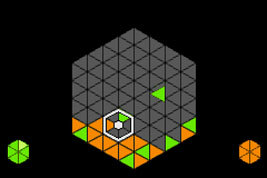 More triangles fall from the top of the screen as you play, and more colours are added as you clear more Hexes. Glowing triangles have a special effect on the play area when cleared. The game comes with several unlockable single player modes as well as a multiplayer game.